Construction is being considered for several Muscogee (Creek) Nation properties in Okmulgee as part of the tribe’s new master plan. The four sites in the master plan are the tribe’s headquarters, off Highway 75 (N. Wood Drive), the Omniplex, the former Okmulgee Country Club, and the tribe’s existing industrial park. 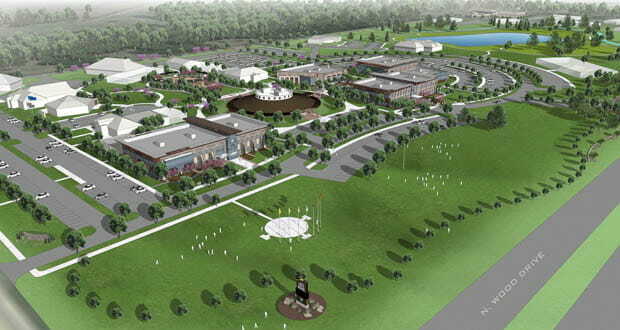 Phase one of the plan includes a new citizens services building at the headquarters and developing a cultural center at the former country club. The planning process started in fall 2017 and it took the Oklahoma City-based New Fire Native Design Group about a year to complete the plan. New Fire President Jason Holuby said the firm looked at each site to see how it was being used now and what would be the best use for each piece of land. Holuby and his team talked to people in every department to see what they did and what other employees they often work with. Staffing projections were also considered at the headquarters complex when looking at the new buildings’ dimensions. He said some departments had been approved to hire new people, but there was no place for the new employees to go. Holuby and his team also met with the tribe’s leadership to understand their visions for the properties. Expressing the nation’s culture through the buildings will be important. The Muscogee (Creek) Nation’s updated tribal complex is only one area in the new master plan where culture will be highlighted. The tribe will turn the former country club into a cultural center where events can be held, said Jesse Allen, the tribe’s interior secretary. The former nine-hole golf course will no longer be used. It will have walking trails, and a replica mound will be constructed. A small amphitheater is planned for the site, as well as a bow-and-arrow shop and traditional archery range. At the Omniplex, a new amphitheater and expo center are in the plan. The Omniplex is on the west side of Highway 75, along Fairgrounds Road. The tribal office complex is on Highway 75’s east side. The Omniplex already has four softball fields and a small cultural center. Allen said there are two expo-type buildings being considered for the Omniplex. One building would be a large, open, hard-floor expo building, and the other would be similar, but with a dirt floor. Allen said the tribe has a strong 4-H program, so it wants to have a place where 4-H-related events can happen. The hard-floor building could also house craft shows and other activities. The industrial park is home to several tribal-related departments, such as construction and tribal roads. The master plan calls for adding more parking and expanding the large-machine storage area. McIntosh said tribal leadership is looking at how the master plan will be implemented and how it will be funded. During his Jan. 26 State of the Nation address, Chief James Floyd said the tribe has about $372 million in its Permanent Fund, but that money will not be used to develop the master plan. McIntosh said the master plan has been received well by tribal citizens. Holuby is a Muscogee (Creek) citizen and said he can remember going frequently to the tribal headquarters for services. He said the best part of the developing the plan was getting to meet the tribe’s longtime employees. Many of them had their own ideas on how the offices could be arranged better. “It means a ton for me as a Creek citizen to do something that will make a difference for the tribe, its citizens, and the tribal employees,” he said.